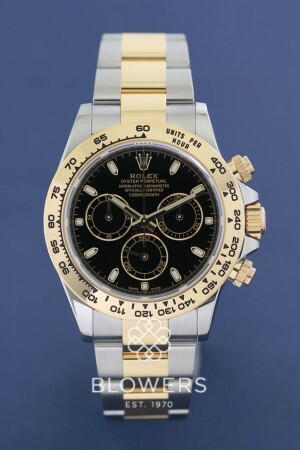 Rolex Oyster Perpetual Cosmograph Daytona 116503. 40mm steel and yellow gold case. Automatic chronometer chronograph 4130 calibre movement. Power reserve of 72 hours. Black dial with black sub dials. Yellow gold bezel. Steel and 18ct Yellow Gold Oyster lock bracelet. Folding Oysterlock safety clasp with Easylink 5 mm comfort extension link. Scratch-resistant sapphire crystal. Waterproof to 100 metres. Box and papers dated February 2017. SKU: 3007309. Categories: Daytona, Gents, Rolex.